'Computer Science' continues where the popular 'Videogame Mania' left off, with 66 patches inspired by classic sounds from such game systems as the Commodore 64, Amiga, Spectrum ZX and Nintendo Entertainment System. All 8 Macro Controls have been intelligently assigned to each Patch. 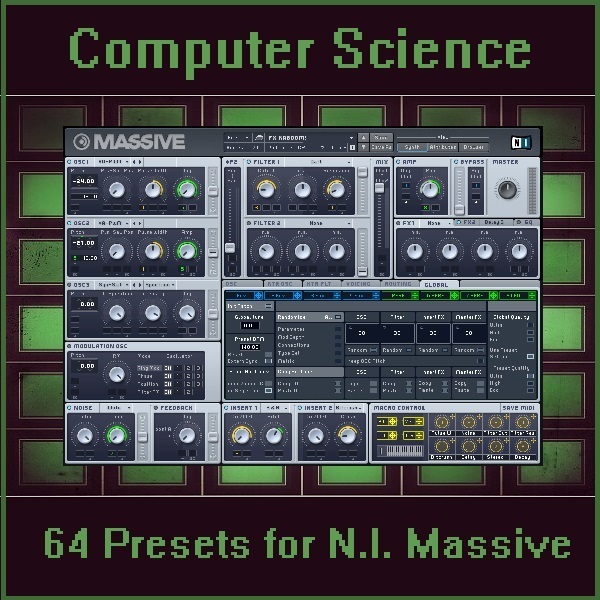 Please note: The soundset is in NMSV format only. Bryan 'Xenos' Lee has worked as a sound designer for such companies as Native Instruments, Cakewalk, Rop Papen, ReFX, Camel Audio, Image-Line and many more. His work is found in several Native Insruments Maschine expansions and the factory presets of such synths as Z3ta 2, Alchemy, Gladiator, Punch, Toxic Biohazard, Scanned Synth Pro 2, Chipsounds, Hive, D.I.V.A., etc. He is also very active in developing his own brand, Xenos Soundworks. Nostalgic Circuits - 80's sounds for U-He Diva.